Organizations are moving at the speed of light, but the truth is that you can only get to full implementation as quickly as each person is willing and able to change their own behaviour. 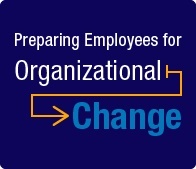 What can you do to proactively prepare people for what to expect? The good news is that the dynamics of change are quite predictable. There is a substantial pay-off for both the individual, and the organization, when people have a sense of control over their environment.